Many recently established non-native insect species appear to be spreading across Europe significantly faster than before. The box tree moth (Cydalima perspectalis), a native to Asia, is illustrative of this trend. First recorded in 2007 in Germany, the moth has then colonized in less than 10 years more than 30 countries in Europe and Asia Minor, causing significant damage to wild and ornamental Buxus trees. It has been hypothesized that the trade of ornamental box trees between China and Europe was responsible for the moth introduction while plant trade among European countries may have caused its rapid spread. 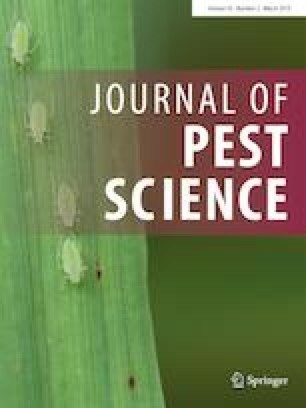 To clarify the pest invasion history, we analyzed the genetic diversity and structure of its populations in the native and invaded ranges, using a 1495-bp fragment of the mitochondrial cytochrome oxidase I and II genes. Moth genetic diversity in Asia compared to the one observed in the invaded Europe and Asia Minor suggested that the invasive populations probably originated from eastern China. Furthermore, the high genetic diversity coupled with the spatial genetic structure in the invaded range suggested the occurrence of several introduction events, probably directly from China. Moreover, the spatial genetic structure in Europe and Asia Minor may also reflect secondary invasions within invaded range because of ornamental plant trade among European countries. The online version of this article ( https://doi.org/10.1007/s10340-019-01111-x) contains supplementary material, which is available to authorized users. Many collaborators helped with the sampling, greatly improving this research. We would like to acknowledge Agathe Dupin, Annette Herz, Anna Maria Vettraino, Attila Haltrich, Bogdan Groza, Christian Burban, Caroline Gutleben, Cyril Kruczkowski, Christian Stauffer, Carlos Lopez Vaamonde, Delphine Fallour-Rubio, Dinka Matošević, Evangelina Chatzidimitriou, Estelle Morel, Gabrijel Seljak, Géraldine Roux, Gergely Bán, Ivanka Ivanova, Jan Soors, Jean-Claude Martin, Jean-Emmanuel Michaut, Jurate de Prins, Kahraman Ipekdal, Katalin Tuba, Liesbet Van Remoortere, Maria da Conceição de Lemos Viana Boavida, Marja Van der Straten, Milka Glavendekić, Philippe de Champsavin, Patrick Pineau, Peter Zach, Richárd Oláh, Stanislav Gomboc, Shiroma Sathyapala, Valery Shurov and Yazdanfar Ahangaran for their aid in this task. We also wish to thank Zhiheng Wang and his colleagues for letting us use their data on Buxus species distribution in China. We are grateful to Augustine Jacquard, Alizée Ribas, and Charlotte Mathieu for carrying out the DNA extraction and sequencing. This research was funded by the INCA project (INvasion fulgurante de la Pyrale du buis CydalimA perspectalis en Région Centre Val de Loire), which was financed by the Centre-Val de Loire regional government in France (Project INCA APR IR 2015 – 0009 673). This research was also supported by the Higher Education Institutional Excellence Program (1783-3/2018/FEKUTSTRAT) awarded by the Ministry of Human Capacities within the framework of plant breeding and plant protection researches of Szent István University. This study was funded by the Centre-Val de Loire regional government in France (project INCA APR IR 2015 – 0009 673). The authors state that there is no conflict of interest. All applicable international, national, and/or institutional guidelines for the care and use of animals were followed. Specimens sampled did not involve endangered nor protected species.